Finally, here in the US we will be able to get oppai mouse pads! 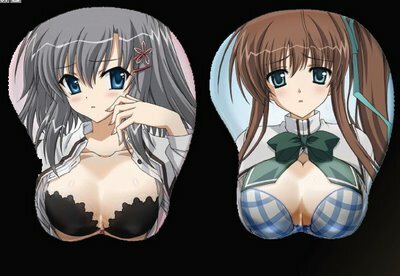 Up until recently, the only way you can grab these awesome takes on cushioned mouse-pads was to order directly from a store in Japan. None of my local suppliers had them except for one that look liked a sad attempt by an American anime-drawing hopeful. Thanks to my good friends and direct-from-japan supplier, Mile-Stone we can now see more here. I wasted no time in placing them in the store. They won't be out for another month or two but I'm glad we don't have to pay about $80-$100 for these. Currently I have Mizore Shirayuki, Katagiri Yuuh, Moka Akashiya and Minato Nagase on their way but there will also be a Kanu one coming as well. Moka and Kanu are the ones I'm debating on for my anime work station. Woot I can't wait.... first I need to get my hands on some money, gerrrrr. Soon I shall have a goood mouse pad... I just have to keep my cat away from it.